I will be staying in Slough and will be visiting London for one day with my family of 2 adults and 2 children. It appears to cover bus, tube, tram, as well as the journey from Slough to Victoria station and back, for just £29.20. 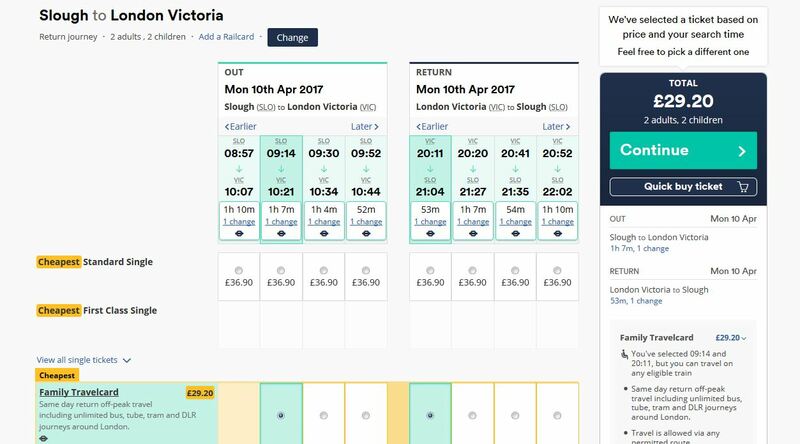 Firstly, you may have confused the system by asking to travel to London Victoria, which is not where Slough trains arrive; these come into London Paddington (you see the "1 change" message above telling you that a tube journey from PAD to VIC will be required). That said, it is a good way of forcing the system to show you the family travelcard as an option. The one-day travelcard (from outside London zones) is two tickets welded-together into a single piece of paper: a one-day off-peak travelcard for TFL, and an off-peak day return for the train company, and as such are subject to the conditions on both. The one-day off-peak travelcard does indeed permit unlimited travel on buses, tubes, and trains (with the exception of Heathrow Express, and certain other services), Docklands Light Railway, and London Tramlink within the validity period and the boundary of zone 6. It also gives discounts on scheduled riverboat services and the Emirates Air Line (the cable car across the Thames near City Airport, which is jolly good fun if you can face travelling via a steel cable stretched right across a runway's flight path!). can be used from 09:30 Mondays to Fridays, all day Saturdays, Sundays and public holidays, on the day(s) of validity and for any journey that starts before 04:30 the following day. which is nearly useless, hence the level of humour. From Cambridge, where I live, I may take any train that arrives in London after 1000 Mon-Fri (and any train at weekends); this is not dissimilar to your experience, your earliest permissible train bing the 0914 at SLO, arrriving PAD at 0949. But the Cambridge one also has restrictions on the return journey; these depend on whether I depart from London Kings Cross or London Liverpool Street, so you would be well-advised to check your return journey also. Note that these are open tickets, not advance purchase ones, so even though you will find it useful to specify your intended rail journeys in and out of London to confirm validity, the ticket as purchased is not linked to these specific journeys and can be used on any valid train. If you do try to take a train on which the ticket is not valid, you may get lucky and be refused by the ticket barriers (of course, these sometimes refuse valid tickets also). If you are unlucky and do get on a non-valid train, and are caught, you will get a swingeing penalty fare, so do not do that if you can avoid it. Having a printout from a ticket-issuing website showing that your ticket is valid on the train you have taken is usually enough to convince the inspectors. Not the answer you're looking for? Browse other questions tagged trains tickets london or ask your own question.